Happy Tuesday! Some days, finding Fun Stuff is real easy. Today is one of those days. Seems like no matter where we look, there's Fun Stuff. Trouble is that we have to stop harvesting Fun Stuff because we have to go to Phoenix today to pick up Sweetie Susun. She's flying back from San Diego. Naturally, we're heading down early to spend the day running errands, buying stuff and doing all our Big City chores. Today is one of those days were we could easily sit here all morning because there's so much Fun Stuff online. Some days there's nothing at all and then a day like this one comes along. Geeze, what's a guy to do? OK, we decided to make this our Lead Story today. We know some people who get really excited about trilobites. We sure do. Imagine our joy when we found this article. 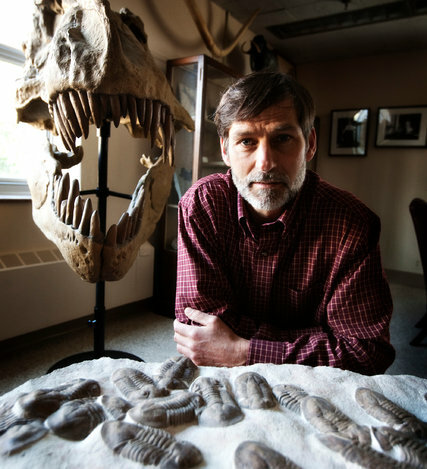 And, get this, the article even include an "Ode To Trilobites." It really doesn't get any better than that for Trilobite Fans. Nope, especially since this is from the esteemed New York Times. Trilobites really hit the BIG TIME! WOW! "...the trilobite could be a kitchen utensil for Salvador Dalí." The Pokeymon (AKA: Pocatello NWS) have been getting really creative lately with their daily weather graphics. This one is sweet, indeed. Looks like the areas of highest probability for 8 inches of snow sit astride the two spots we're watching closely: Banner Summit and Two Ocean Plateau. If this much snow actually does come to visit those two areas, it should put Banner Summit back to normal and send The Upper Snake River watershed over 150% of normal! Below in bold italic is the snippet which accompanied the graphic above. "The next surge of moisture will make its way back into Idaho Wednesday afternoon. 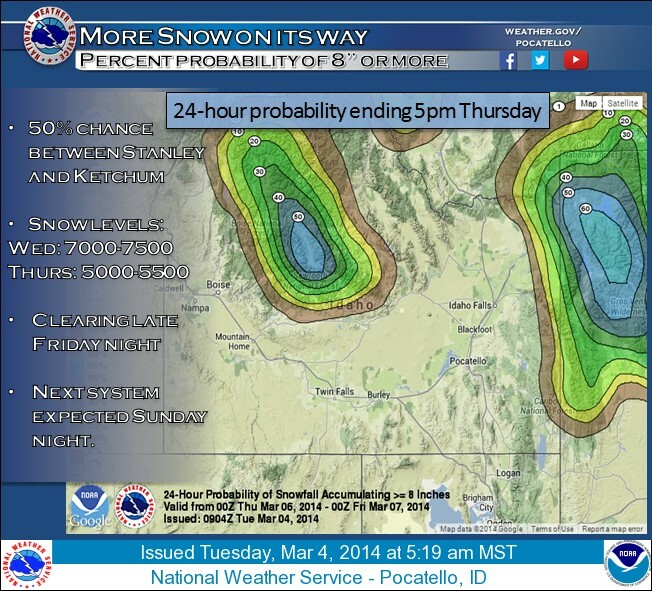 Snow totals of up to 8 inches are possible in the Central Idaho Mountains and Upper Snake Highlands. The snow levels will be fairly high on Wednesday, but will lower after a cold front passes through Thursday afternoon. Most of the Snake River Plain will see rain through the period. We may see another surge of moisture in the area Sunday night." This story falls under the category of "What Will They Think Of Next?" Kinda weird, actually but, oh, so typically techie. What can you say about Vienna Sausages? Well....read on. 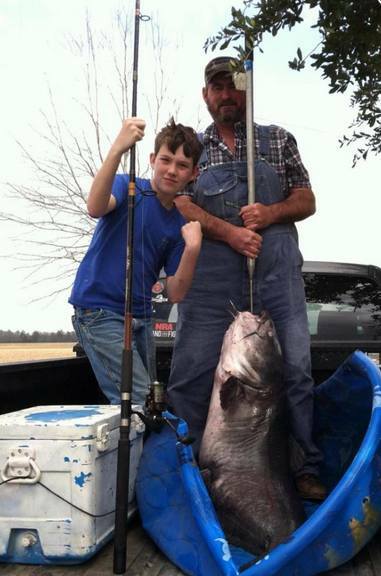 12-year-old Lawson Boyte reeled in a record-setting 114.1 pound catfish from the Mississippi river. The Oak Grove, Louisiana boy told KNOE 8 News, “I was just reeling in to check my bait and when I pulled back, that pole pulled back down to the water.” Despite Boyte weighing just 100 pounds, he was able to pull in the monstrous catch that broke the previous Louisiana record of 110.19 pounds from April 2005. Boyte was out fishing with his uncle, Jim Danley, and cousin, Bo Danley, when the swimming behemoth grabbed a hold of the shad bait. 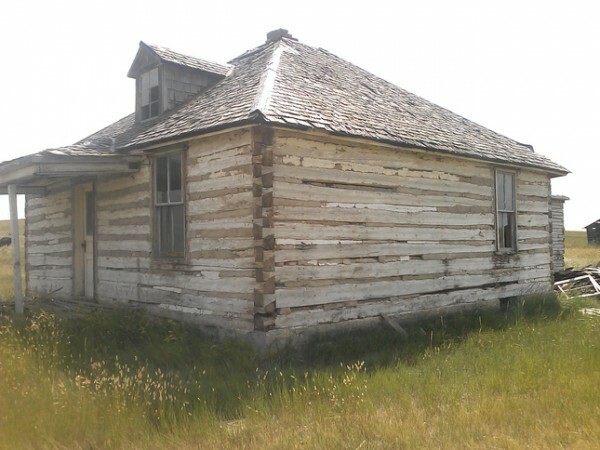 But the six-grader doesn’t think it wasn’t just the bait that did the trick. He says it was his special snack. "It was more luck than it was skill to catch that big fish. 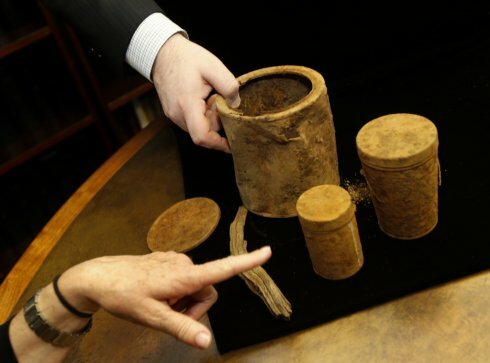 I think the thing that done it was eating Vienna sausages," said Boyte. Jim Danley takes the boys out fishing as often as possible and told the station, “There was some old men that fished the river, was kinda like my heroes you know, and it finally happened. I got him. Or that boy got him but I was there with him you know. So that, that make it all worthwhile.” Bo agrees saying, “It’s cool to know that I was there to witness it. It’s a once in a lifetime thing. It don’t ever happen much.” At the start of the week the enormous fish was sent to the Louisiana Department of Wildlife and Fisheries to determine the exact species and age of the fish. "Bombastic styling and outrageous dimensions make the Lincoln look like a comic book villain’s daily driver. They were Brobdingnagian in scale and an expression of dimensional absurdity." Finally---a credible theory about where all those coins came from. 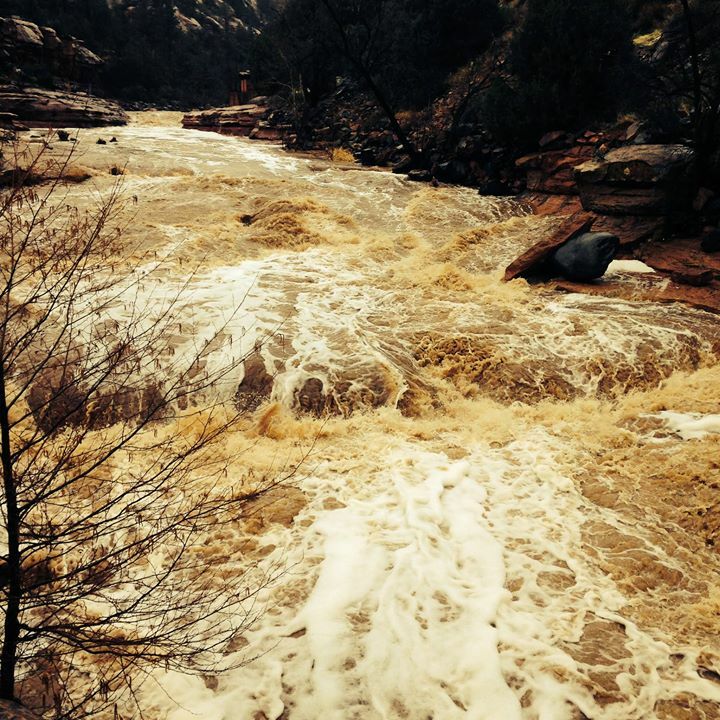 Here's Oak Creek at Slide Rock during this weekend's storm event. Upper Oak Creek got 3.25 inches of rainfall!